Do Indigenous customs fascinate you? Are you passionate about history, nature, and would like to try a traditional experience? Travel back in time and spend a night in a teepee at the Innusit Village. This thousand-year-old accommodation is much appreciated for its friendliness and its unique style. During the day, activities related to the discovery of Quebec’s flora and fauna await you. Children will have a lot of fun painting war makeup and making their bows and arrows out of items found in the woods. 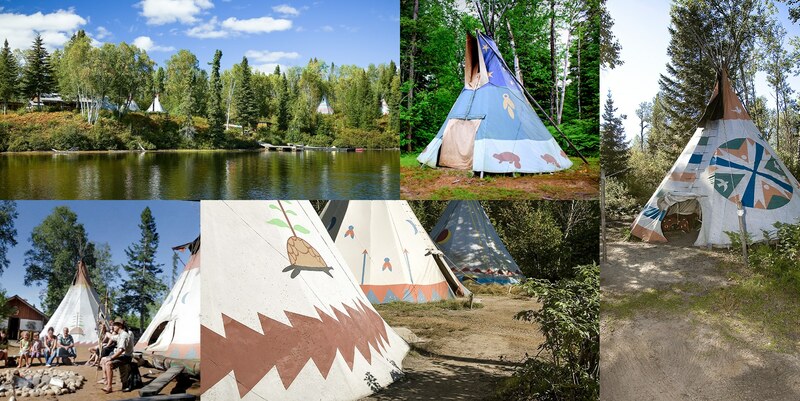 The Innusit Village teepees can be found on the shores of the Batiscan River in the heart of the Haute-Mauricie forest, which gives the site a remarkable character marked with authenticity. The site can be accessed by boat from the private parking lot, or from La Seigneurie du Triton closeby. Come and enjoy the same experience as our satisfied customers. Imagine being comfortably bundled up in a sleeping bag, warmed by a fire in the centre of the teepee while sharing good moments with your family, your friends or your partner. That’s the magical experience of a night in the teepee! Teepees can accommodate from 2 to 8 people, and they are equipped with sleeping bags and camping cots. You can book a private teepee for your family. On site, modern toilets, individual changing rooms and rudimentary showers have been installed. During your stay in the Innusit Village, you can participate in activities related to the Aboriginal way of life, such as canoe and rabaska canoe tours, nature and beaver observation, hiking, picking of wild mushrooms and berries, etc. In the evening, share your adventures of the day around a campfire. The package includes self-catering activities, the sleeping bag and the camping cot, a friendly meeting around the campfire in the evening and 2 packed lunches, one for the continental breakfast and the second for the evening meal. Each tipis has its own grill and outdoor picnic table to take your meals with your family, you only have to heat everything according to the instructions left by the chef. In case of rain, you will have the opportunity to cook your meal on the large wood-fired grill accessible inside the longhouse that can accommodate all families staying at the Innusit Village, you can also settle there and get shelter from flies and rain. The international cuisine with traditional inspiration is delicious and the meat grilled on a wood fire creates a warm ambiance. You will not regret your vacation in a teepee at the Innusit Village. You can also add a lunch cooked on the grill at La Seigneurie du Triton’s Shore Lunch, which is located in the middle of the territory on the shores of La Charité Lake. This spot is accessible by a canoe, with some hiking. You can also combine your night stay in the teepee with a stay at La Seigneurie du Triton, which will totally immerse you in the heart of the forest to recharge your batteries.